Apple could soon beat rival technology giants such as Amazon and Google in becoming the world’s first trillion-dollar company. Following the release of better-than-expected first quarter financial results a few days ago, the Cupertino-based firm kicked off a new week with record high stock. As BGR reports, on Monday, shares in the firm were trading at $187 each for the first time. This brings the overall valuation of the company to over $920 billion. 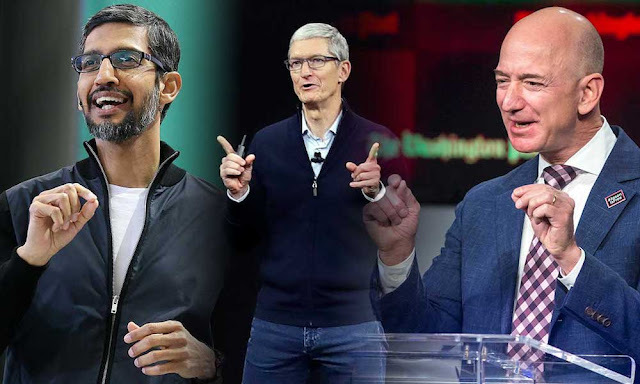 That means that Apple is far more valuable than Alphabet and Amazon, which are currently trading with a market capitalization of $716 billion and $776 billion respectively. It’s likely that Warren Buffett’s recent endorsement of Apple aided the share price hike. Last week, he revealed to CNBC that he bought 75 million shares in the firm at the start of the year. This is despite the fact that analysts had predicted decreasing iPhone sales at the time. He wasn’t put off by this, viewing the tech giant as a steady and long-term investment. Then, speaking to CNBC again yesterday, the billionaire said he’d like to own every single Apple share. “I clearly like Apple. We buy them to hold. We bought about 5 percent of the company. I’d love to own 100 percent of it,” he admitted. While the iPhone maker is closer than ever to being declared a trillion-dollar company, analysts have previously predicted that Amazon could also reach this milestone within the next year. In February, GBH Insights analyst Dan Ives estimated that the company could reach the milestone in twelve to eighteen months. He said the e-commerce giant has seen impressive growth across its retail and cloud computing businesses. “The Prime membership moat that [CEO Jeff] Bezos & Co. have built is gaining further steam in the field, and the Amazon ‘flywheel effect’ is further playing out globally among consumers,” he said in a note discovered by CNBC.